Issue the command and you will see a list of all the layers in your DWG. By highlighting one of them, you will see only the layers on that highlighted layer. Select another layer and you see only that layer. Double-click a layer name to turn the Always Show option on or off. This will display a small asterisk next to the layer name. 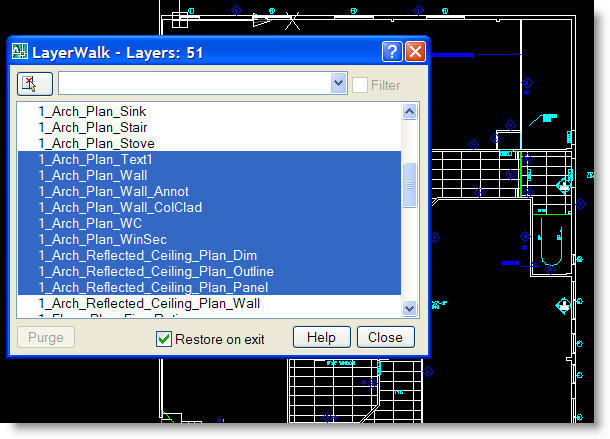 Now when you select another layer the asterisked layer(s) will stay visible. 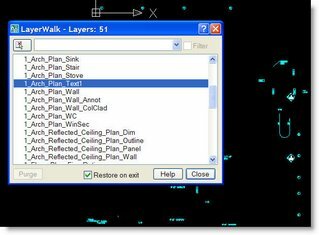 Press CTRL and click layers to select multiple layers. Press either CTRL or SHIFT and double-click in the layer list to turn the Always Show option on or off. Click and drag in the layer list to select multiple layers. Make sure the Restore on Exit box is checked. Then when you close the dialog box, all the layers will be restored as they were when you entered the command. 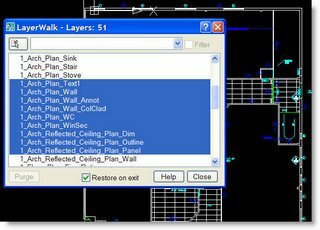 I USE AUTOCAD 2008 AND WHEN I TRIED LAYER FLY A WHILE BACK AND EVER SINCE THEN LAYER WALK WILL NOT WORK IT HANGS UP AUTOCAD AND YOU HAVE TO HIT EXCAPE TO UNLOCK IT. ANY IDEAS ON WHAT IS CAUSING THIS?